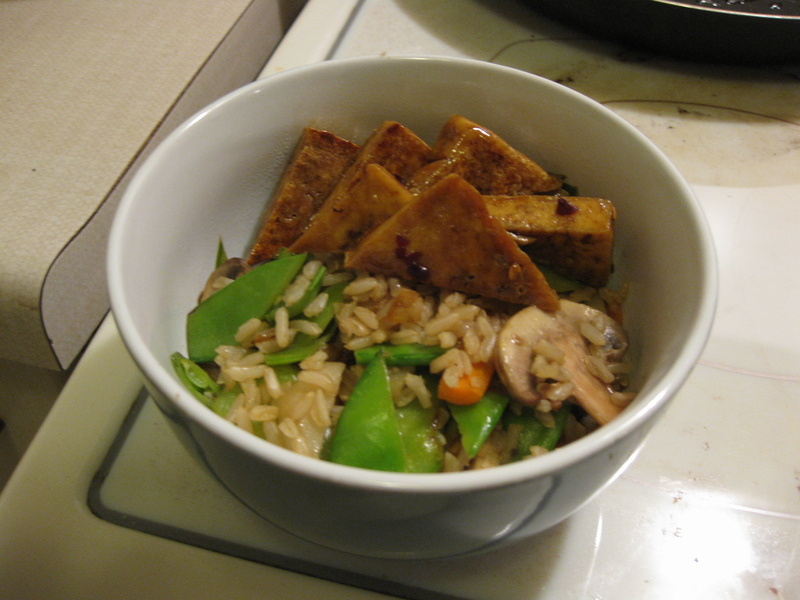 veganmofo 6: Asian-Inspired Foods | Go Fork Go! So this post is dedicated to Asian-Inspired Foods. 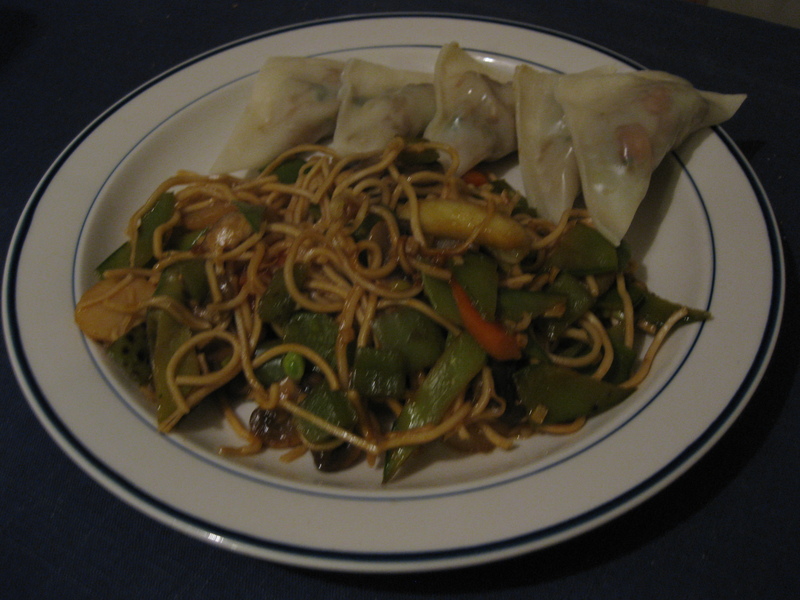 Vegetable Dumplings with Szechuan Noodles: The vegetable dumplings are from a recipe on Sugarlaws and were delicious. The only thing about the dumplings is that at some point, you have to either mash or cut up the cooked carrots, broccoli and cauliflower. I elected to take a pair of scissors and try to slice through everything since I realized that a bit too late. In the future, after cooking the veggies, I will either take a potato masher to them or a pastry blender or just take a knife and chop them all up before adding the sauces. The szechuan noodles are inspired by this recipe but I added snow peas (ends cut off and sliced), water chestnuts, carrots, celery and mushrooms and omitted the chili sauce, peanuts and cucumbers. I felt that there was a bit too much soy sauce and would probably cut back on that the next time around. Plus my skills at dealing with dried noodles sucked here too. I needed to soak the noodles longer or something. Fried Rice and Sweet-Chili Tofu: Simple fried rice with teriyaki and soy sauce with the sweet chili tofu I blogged about on day 1. I’m not sure why this is here… I’m usually pretty good at making fried rice 🙂 It’s one of my favourite dishes – so simple and a great way to use up whatever leftovers from the last few days. I know most people make fried rice from scratch but one of my favourite ways to make fried rice is to take dishes from previous days, chop them up into small pieces and throw the food along with the sauce into a fried rice recipe, mixing all the flavours and sometimes adding new ones. It adds an extra dimension to fried rice and makes it different every time rather than following the same set recipe. Makes it faster to cook too! Plus then you’re not stuck eating the same leftovers for days on end. Yaki Soba with Dumplings and Sweet Chili Tofu: Yeah yeah, I’m addicted to that sweet chili tofu. 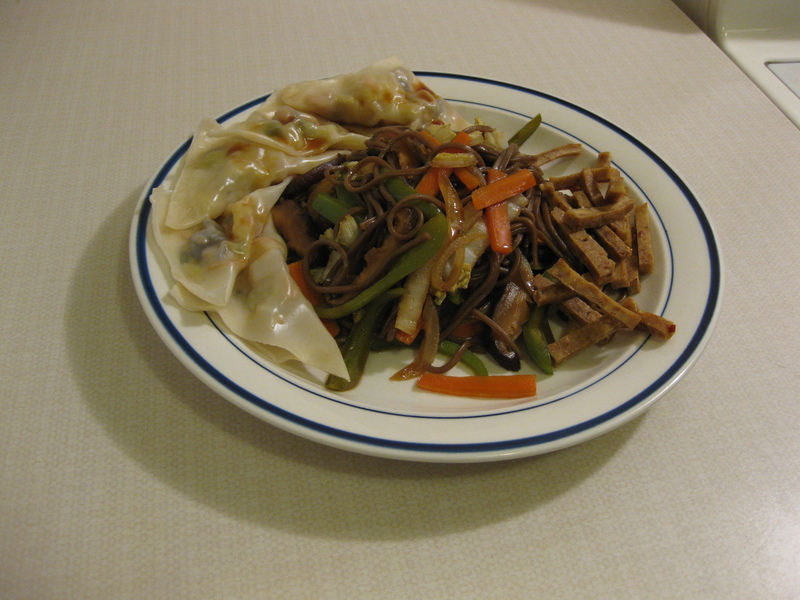 The yaki soba is from this recipe with the appropriate vegan modifications (replace worcestershire sauce with vegetarian worcestershire). I added carrots to my dish too. My sauce turned out too watery but it’s my fault – I failed to read the part where it says to let the sauce caramelize. In addition, I’d whisked my sauce together in a tofu container and a lot of the sugar got left in the container so I’m not sure that my sauce would’ve caramelized correctly anyways. Lastly, I used rehydrated shiitake mushrooms… which absorb a lot of moisture. I found the sauce pretty vinegar-y and with every bite of mushrooms, it felt a bit like drinking vinegar. Next time I’ll add the sugar straight to the pan last and only whisk the liquid ingredients together. I’ll also cut down the rice vinegar to 1/4 cup rather than 80ml (which is 1/4 cup + 1/3 of 1/4 cup). The dumplings were stuffed with chopped up napa cabbage and shiitake mushrooms and grated carrots sauteed in some soy sauce and sesame oil. They didn’t have enough soy sauce or sesame oil. It didn’t stick around, which was a blessing since it was pretty brutal. In fact, it was super nice yesterday (Sunday) – you’ll see in my future posts of some food from Sunday that it was really sunny. I went for my long run and it was gorgeous, one of those perfect run days! I wasn’t even wearing gloves (Although my pullover has cuffins) and my fingers didn’t even freeze! Sadly, I think I got another blister on my toe from the run. TMI, but I have this toe that’s a year-round blister. Ugh. Coming up this week: More baking (Which I’ve already eaten a LOT of), and a recipe for a sweet and sour veggie stir fry. Also, my new spice “rack”! Sort of related: I now have a ton of leftovers in my fridge from all the cooking I’m doing. I can’t even freeze the leftover soup because I’ve run out of those 2 cup containers I have for the freezer (I may have to go pick up a couple more or something). Also, I’m now about 6,000 words behind on nanowrimo from where I wanted to be today. Whoops. Yum! I’d eat all of that – especially the soba noodle dish – yum. 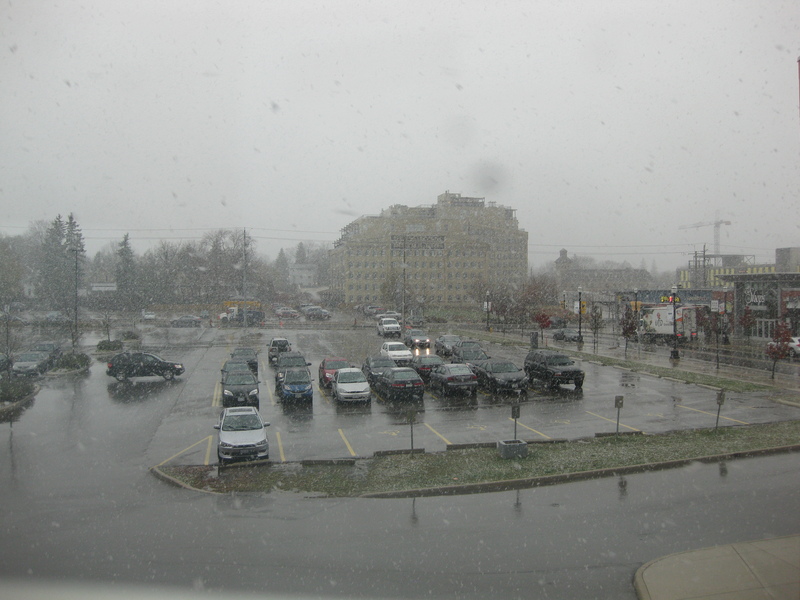 I’m SO jealous of the snow, I’d love to live somewhere where it was definitely going to snow in winter.